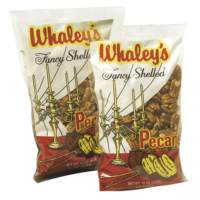 Gift Bags – Whaley Pecan Company – Quality Fresh Pecans Since 1937! Bourbon Praline Pecan Gift Bag 8 oz. Glazed Pecan Gift Bag 8 oz. Gourmet Dark Chocolate Pecan Gift Bag 8 oz. Gourmet Milk Chocolate Pecan Gift Bag 8 oz. 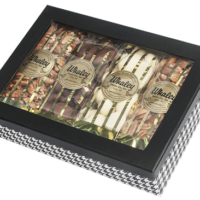 Gourmet White Chocolate Pecan Gift Bag 8 oz. Houndstooth Gift Box 2 lbs. Orange Pecan Gift Bag 8 oz. 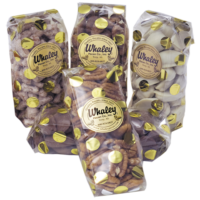 Praline Pecan Gift Bag 8 oz. 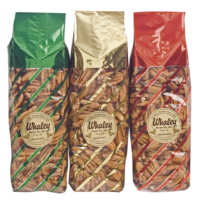 Roasted & Salted Pecan Gift Bag 8 oz. Roasted and Salted Gift Bag Trio 3 lb.